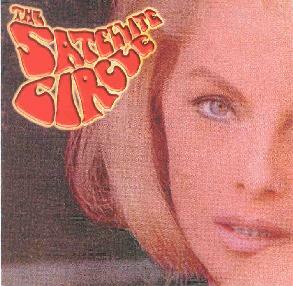 The Satellite Circle - "s/t"
This band make no secret of their driving inspiration. A cover featuring large, pink bubble letters and a girl with a 70s hair-do leave no ambiguities about classification. This Swedish trio are the ultimate in psychedelic stoner doom metal. Massive, ripping guitar distortion, echoing drums, sitars, and tambourines lay waste to all cheery exuberance. You'd think they would have painted themselves into a corner that precludes any originality, but the results are astounding. From the pounding, bouncing riffs that can only exist in the furthest realms of psychedelic doom to the dark sitar drones that echo out of the 60s, Satellite Circle are easily the best practitioners of sonic retro-gazing I've heard. They are as talented as they are devoted. I'd say they're even giving Lee Dorian, front man for Cathedral and godfather of retro, a run for his money. The shamelessly-titled "The Thin White Line Between Happiness and Sanity" is the most Sabbath-like venture on the CD. The vocals on this cut are stylized to true stoner rock fashion, but they are not representative of the norm. The vocalist sounds like Glen Danzig with a raspy, rock edge instead of a gothic flavor. "Black Mountainside," a very dark and brooding track, shows his versatility to adapt to different styles. Most of the songs are straightforward, energetic assaults. "The Beginning of the End of the World" is a beautiful guitar piece that strays from this formula with fantastic results. I wish the band had tried more variation because they're good at every style they attempt on this CD. The doomy sludge they offer here is definitely worth checking out for fans of psychedelic rock. As for stoner doom fans, any CD where the guitar pack more bass than the drums is must-have. For more information you can visit The Satellite Circle web site at: http://www.satellitecircle.com/. Contact via snail mail c/o The Satellite Circle; c/o Fredrik Holmgren; Hyvlargränd 14c; 907 38 Umeå; Sweden.